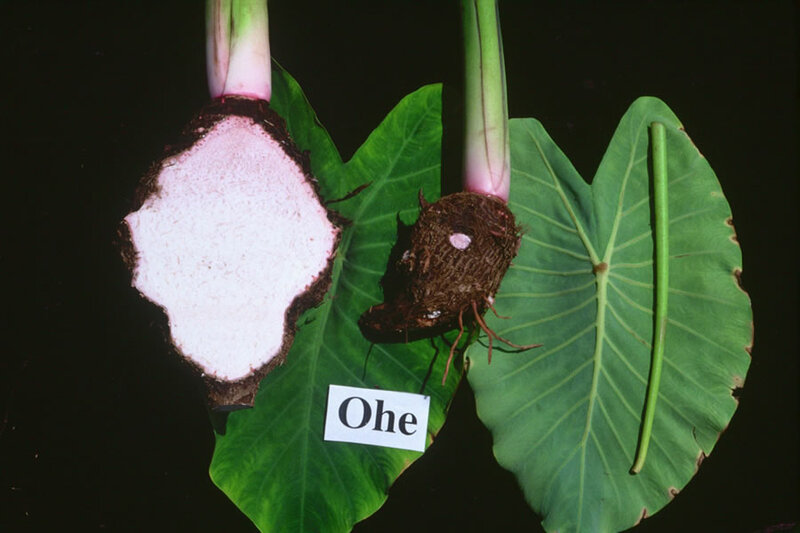 General Characteristics: Medium in height, well spreading, stocky, maturing within 12 to 16 months, producing from 5 to 10 oha; characterized by light green petioles with light reddish-brown tinge on lower half. Petiole: 60 to 80 cm. long, light green tinged with light reddish-brown on lower half, with inconspicuous, narrow, reddish-brown edge, an orange-red or dark pink ring at base with light greenish or pinkish area for 3 to 5 cm. above. Leaf blade: 35 to 45 cm. long, 20 to 30 cm. wide, 30 to 35 cm. from tip to base of sinus, sagittate, thin in texture, medium green; margins slightly undulate; piko whitish to light brownish; lobes acute with wide sinus. Corm: Flesh white with light pinkish tinge, especially near apex, and yellowish fibers; skin light pink. Origin, and derivation of name: Native variety; Ohe is the Hawaiian name for bamboo and probably refers to the similarity of the petiole coloring to the stem coloring of a certain variety of Hawaiian bamboo. Distribution: Very common in Kona, Puna, and Kau on Hawaii, primarily under upland culture. Use: Makes poi of excellent quality. Remarks: This variety is an important upland poi taro, especially well adapted to elevations above 1,500 feet.